Overview: It's Halloween, and Splat is determined to be the scariest cat in the class. Unfortunately he's just too much of a scaredy-cat. He's afraid of a little spider, and everyone says his costume looks more silly than scary. And when Mrs. Wimpydimple tells a ghost story in the dark, Splat gets so frightened that he tips over his jack-o'-lantern. But when the lights go back on, the entire class is scared silly by a small, black, furry creature with a big pumpkin head. Whooooo can it be? Overview: PRESCHOOLERS WILL CHEER the return of Duck and Goose in their fourth board book appearance. This time, Duck and Goose are looking for the perfect pumpkin. Is it in the log? Is it under the leaves? Is it in the apple tree? Young children will surely enjoy going on a pumpkin hunt with Duck and Goose . . . especially when they find the perfect pumpkin at the end! Overview: Halloween is here, and Curious George is getting ready for the big night. There are so many costumes to try on, treats to share, and games to play! George has so much Halloween fun picking out the perfect pumpkin, decorating his house, and celebrating with his friends that he’s not sure he’s ready for the day to end. Follow the little monkey through his fun-filled day with this book of poems. 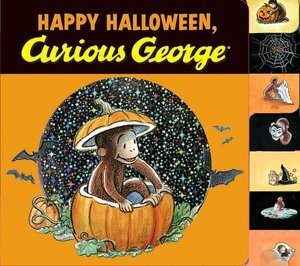 Happy Halloween, Curious George is a sweet treat to help Curious George fans of all ages get in the Halloween spirit. Overview: Boo! Join the Sensational Six as they visit the Trick-or-Treat Tower for the big Halloween party. But they have to get there before the moon is full. Young readers will enjoy using Mouseketools to help Mickey and the gang find their way to the tower in time with this spook-tacular Halloween lift-the-flap adventure.